I suppose this is old news, but I'll post it for those folks who may not have heard. 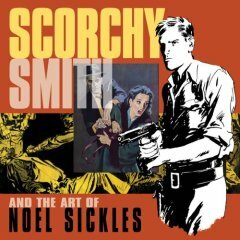 IDW is publishing Scorchy Smith And The Art Of Noel Sickles. Here is from the book's description: "Noel Sickles drew comics for three brief years, yet his groundbreaking work on the 1930s aviation adventure series Scorchy Smith is a milestone in the history of newspaper comic strips. Over the past 70 years, however, readers have seen only occasional excerpts of this seminal work. Now, IDW's Library of American Comics presents Scorchy Smith and The Art of Noel Sickles, a comprehensive, oversized volume that collects, for the first time, every Sickles Scorchy strip, from December 1933 through November 1936." Alex Toth was a contibuter to the old reprints published by Nostalgia Press in the seventies. Now we will have 352 pages of Noel Sickles Scorchy Smith! Cool huh?